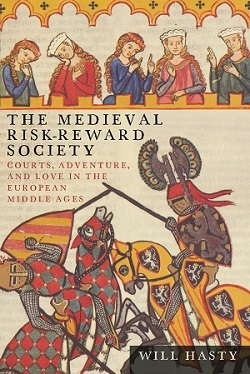 The Medieval Risk-Reward Society: Courts, Adventure, and Love in the European Middle Ages offers a study of adventure and love in the European Middle Ages focused on the poetry of authors such as Marie de France, Chrétien de Troyes, Wolfram von Eschenbach, and Gottfried von Strassburg—showing how a society based on sacrifice becomes one of wagers and investments. Will Hasty’s sociological approach to medieval courtly literature, informed by the analytic tools of game theory, reveals the blossoming of a worldview in which outcomes are uncertain, such that the very self (of a character or an authorial persona) is contingent on success or failure in possessing the things it desires—and upon which its social identity and personal happiness depend. Drawing on a diverse selection of contrasting canonical works ranging from the Iliad to the biblical book of Joshua to High Medieval German political texts to the writings of Leibniz and Mark Twain, Hasty enables an appreciation of the distinctive contributions made in antiquity and the Middle Ages to the medieval emergence of a European society based on risks and rewards. The Medieval Risk-Reward Society takes a descriptive approach to the competitions in religion, politics, and poetry that are constitutive of medieval culture. Culture is considered always to be happening, and to be happening on the cultural cutting edge as competitions for rewards involving the element of chance. This study finds adventure and love—the principal concerns of medieval European romance poetry—to be cultural game changers, and thereby endeavors to make a humanist contribution to the development of a cultural game theory.